The Grid & Raster Editor provides a set of drawing tools to easily edit single and multi-band raster datasets (integer or floating point rasters) in ArcMap. For instance, one can change the value of a single cell, or change the value of more cells by sketching in the map.Try this tool. The toolbar combines image editor drawing tools (pixel edits) with the possibilities of ArcMap. It is like painting in an ESRI GRID or one of the many other supported raster formats. This creates some advantages above the default ArcMap functionality. In ArcMap it's possible to draw graphics but these are not saved in the underlying geodataset. The Grid & Raster Editor saves the drawings directly in the edit raster by changing the cell values. 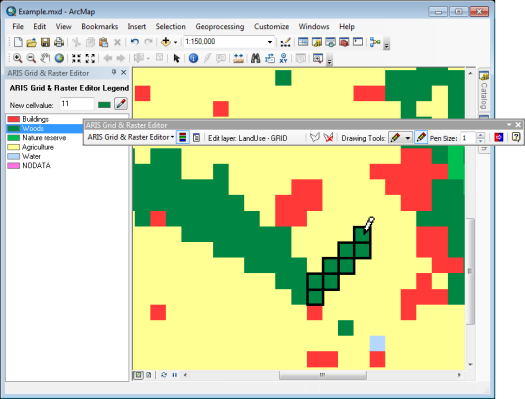 The ARIS Grid & Raster Editor works without need of any extra ArcMap extensions (no need for Spatial Analyst). 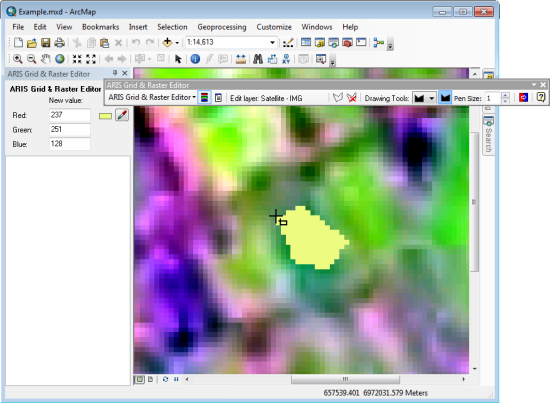 With the ARIS Grid & Raster Editor raster layers in an active dataframe in ArcMap can be edited. After starting an edit session the legend of the selected layer is shown in a dockable window. Here a value can be chosen to assign to the selected cells during editing. The data types / pixel types as supported by ArcGIS for the above raster formats are also supported by the ARIS Grid & Raster Editor. One possible use of the ARIS Grid & Raster Editor is to correct errors in an existing raster. For example, when a raster is generated from satellite or photo imagery, automatic classification can cause misclassified cells through problems with reflection or atmospheric conditions. 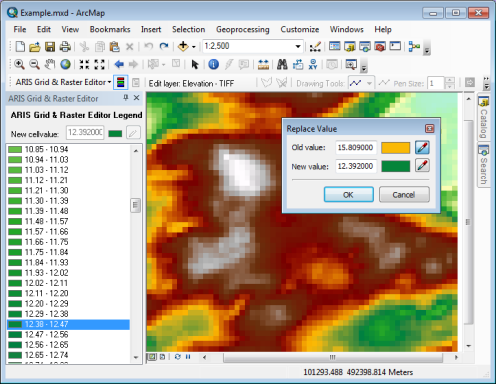 With the ARIS Grid & Raster Editor these cell values can simply be modified. The ARIS Grid & Raster Editor can also be used as a sketch tool. 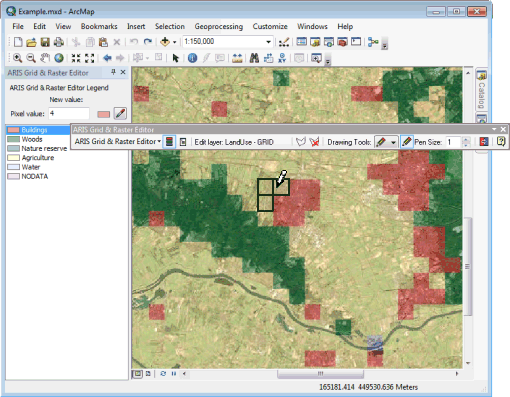 The Grid & Raster Editor can be used to interactively design plans, which can be processed and evaluated with Spatial Analyst tools immediately. See also a story about Correcting Misclassified GRID Cells. Compatible with ArcGIS 10.7 (and still ArcGIS 10.0 - 10.6.1). Compatible with ArcGIS 10.6.1 (and still ArcGIS 10.0 - 10.6). Using less then 3 bands in a Multi-band RGB raster will now use the right color as editing symbol. Editing one cell or a rectangle of cells and using a New Value of NODATA should now also work for File Geodatabase Raster in ArcGIS 10.6.1 (did not work because of a new bug in ArcGIS 10.6.1). Check available versions for your ArcGIS version. The Spatial Analyst extension is not required. Functionality for editing raster data is not available for ArcGIS Pro yet, please contact us if you are interested. Use the Contact Form to request new features like support for: ArcGIS Pro, other raster formats or specific renderers. Suggest modifications to existing tools or request availability for other platforms or versions. Please contact us if you have any other questions about the ARIS Grid & Raster Editor. If you decide to purchase this product, a key will be sent to you by email. This key will enable you to unlock the permanent license. Note: The information in this page is updated to the latest version of ArcGIS/ArcMap and ARIS Grid & Raster Editor. Always check the appropriate manual for detailed version capabilities and limitations. The 2.x and 3.x versions have limited functionality (e.g. only support for editing of files with ESRI GRID format) and will not be updated anymore.